Zimbabwe has been rocked by a series of strikes and protests as citizens pressure President Mugabe's government to provide employment as well as food to millions of citizens who are suffering. Stan Zvorwadza is a key leader of these brave fights against poor working conditions, non payment of civil servant salaries by the government, and the brutal harassment of street vendors. 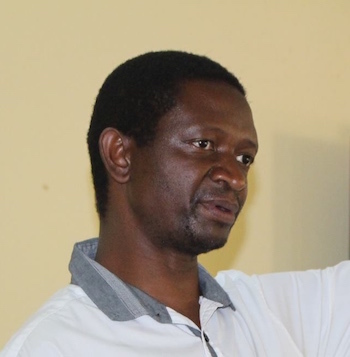 Zvorwadza is the Director and founder of the National Vendors Initiative Trust of Zimbabwe—NAVUZ—a non-partisan organization that represents local vendors. Because the country’s unemployment rate hovers over 90%, many citizens have resorted to street vending in order to secure minimum food for themselves and their families. Under Zvorwadza’s leadership, NAVUZ has not only instituted vendor programs but has also provided seed capital for small business projects. NAVUZ offers training in both entrepreneurship and human rights. This has not gone over well with the government. Police have continually harassed and terrorized vendors, whom they see as posing a threat to a status quo that benefits governmental VIPs but not average citizens. The protests have increased the amount of police brutality, which in turn has increased the number of protests. Now many more people are taking to the streets.